Initially starting from a small-scaled pharmaceutical factory in 1981, BIOLAB is now one of Thailand’s leading pharmaceutical manufacturers. Due to fast-growing demands, we decided to reinvest over $10 million in expanding our production capacity base to 3 times larger than its original scale, 3-storey factory building comprising 24,000 square meters, fully equipped with state-of-the-art facilities, from A to Z, including imported world-class advanced production lines as well as well-equipped R&D and quality control laboratories. Driven by strong commitment to continually develop both our products and quality systems, we are the first company in ASEAN who has been granted ISO 9001 certification for quality management systems since 1999 and just lately ISO 9001:2008. 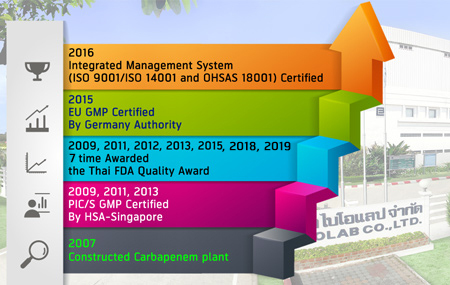 We, additionally, are the first and still the one pharmaceutical manufacturer in Thailand who has complied with the PIC/S GMP standards (recognized by HSA Singapore, since 2009), an internationally recognized standard for manufacturers of medicinal products. Recently, another most honorable award for our excellent work ethics and high standards, we have received "Quality Award" from Thai Food and Drug Administration for two consecutive years, 2009, 2011, 2012, 2013 and 2015. We have built a decade of trust and reputation on our professional services with our customers worldwide, e.g. Japan, Singapore, Malaysia, Philippines, etc. In the near future, we are planning to expand our customer base from Southeast Asia to other countries globally such as Germany, Australia, South Africa, etc.